EDMUND PRIESTLEY was born in Higher Booths on 20 October 1855, the son of James Priestley and Alice Pollard. His father was a power loom jobber. Edmund was the elder of twin brothers, born at 11.20 pm at Chapel Lane, Higher Booths. The birthplace of his twin Edwin is given as Swinshaw, Higher Booths. The location of Chapel Lane is unclear, but Swinshaw Farm and coachhouse are on the northern section of Goodshaw Lane, near Love Clough (east of the A682). In the 1881 census, Edmund gives his birthplace as Crawshaw Booth. This was the second set of twin boys for James and Alice. The 1861 census shows Edmund as a 5-year-old scholar, living with his mother and five brothers at Sunnybank, Crawshawbooth (at the bottom of Goodshaw Lane, below Goodshaw Chapel). His father had died earlier that year. Was amongst the first Sunday Scholars at Sunnyside. At that day they used to write in copy books on Sunday mornings and spell for places in the afternoon, for some of the men were up to 30 years of age and never been to day school. W Nicholls used to have a day school at the bottom of Pinner brow, just above the old Primitive Chapel. I attended that school till I was half time, when I had to go to the National school at the top of C’booth under W Thomas Riley. By the time of his marriage, he had moved to Bacup, where he worked as a weaver. He lived at Higher Change, which is just outside Bacup, along the Todmorden Road. In the late 19th century there was a long terrace of small houses occupied by coal miners, cotton workers and a number of retired workers, and a beer house. In the 1881 census Edmund’s mother Alice was living three houses from the east end of this terrace, with his twin brother Edwin and Edwin’s wife Betsy. The family next door include the daughter Alice Lord, who may be one of the witnesses to Edmund’s marriage. RUTH COLLINGE was born in Bacup, Haslingden district, in the Forest of Rossendale, in the second quarter of 1854. She was the daughter of the farmer Luke Collinge and Grace Speak. In the 1861 census, Ruth is aged 7 and living with her parents and seven siblings at 157 Old Meadow, Bacup. Her father died in 1865. The family moved to 88 Old Meadow. In the 1871 census, 17-year-old Ruth was now a weaver and living with three of her brothers, also weavers, their mother and a young lodger. By the time of her marriage in 1877 she had moved again, to Green’s Nook, Todmorden Road, Bacup. Green’s Nook Lane runs east, along the south side of Bacup cricket field, towards Christ Church. The 1881 census returns suggest that ‘Greensnook’ included the dwellings adjacent to the Vicarage and Schoolhouse at Christ Church. At that time, this included five households, occupied by the families of James Smith, a cotton spinner employing 320 persons; John Hargreaves, a Reed and Heald Manufacturer and Farmer employing 150 hands; two farm labourers’ houses; and a coachman/domestic servant. An 1890 OS map shows a collection of large houses in parkland, opposite the mills and terraced houses on Todmorden Road. Her father was deceased and she was working as a weaver, so she may not have been living at home. Edmund Priestley and Ruth Collinge were married on 20 January 1877 in Bethel Baptist Church, Waterfoot, Rossendale. Waterfoot is about two and a half miles from Higher Change, south-west of Bacup, on the way to Rawtenstall. This may have been Ruth’s place of worship. Edmund Priestley, 21 years, Cotton Weaver, Higher Change, Bacup. James Priestley (Deceased), Power Loom Overlooker. Ruth Collinge, 22 years, Cotton Weaver, Greens Nook, Todmorden Road, Bacup. The witness Edmund James Lord was living at 60 Deardengate, Haslingden, Lancashire in 1881. He was a tailor. The Priestley’s eldest son Edmund James was born in the last quarter of 1878 in Haslingden. Willie followed two years later, in third quarter of 1880. Iin the 1881 census, Edmund Priestley, aged 25, was working as a cotton weaver and living with Ruth and their two sons. Their address was Moss Gap, Bacup, in the parish of Newchurch. Ruth and Edmund had at least four children. Grace Alice was born in Bacup in the last quarter of 1882. The family then moved back to Crawshawbooth, which was Edmund’s birthplace, for the birth of Robert Greaves on 12 July 1885. 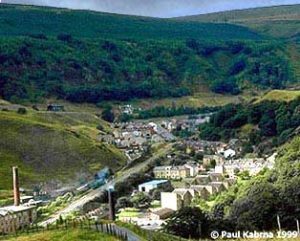 By the 1891 census, the family had moved to Stansfield, a township to the north of Todmorden. The two eldest sons had joined their parents in the cotton mill. 1891 Census. Barker Street, Stansfield, Todmorden, Yorks. Sometime between 1891 and 1896 the family moved again, to Cornholme, near Todmorden. In the second quarter of 1896, ten years after Robert’s birth, another son John Albert was born here. It is said there was another daughter, Alice, of whom nothing else is known. She may have been born in these intervening years. Their house in Cornholme, straddled the beck that divides Lancashire from Yorkshire. The front room was in Lancashire, the back room in Yorkshire. They attended Vale Baptist Chapel. They did not stay in Cornholme long. The family appear to have moved to Earby between John’s birth and 1898. Here, Ruth died on 25 Feb 1898 at the age of 43. She and Edmund are mistakenly recorded in the death registration as Prestley. The cause of death was “Influenza Mitral Obstruction Exhaustion”. Mitral relates to a valve of the heart. Edmund was present at the death. The following year, in the first quarter of 1899, Edmund married Mary Elizabeth Dearden. She was born in Sowerby Bridge in the Calder Valley just outside Halifax. Sowerby Bridge lies seven miles east of Cornholme. Mary was nine years younger than Edmund. Another child, Ruth, was born in Earby in the second quarter of 1900. She was named after Edmund’s first wife. At the time of the 1901 census, the family was living at 10 Spring Terrace, with children who ranged in age from 22 to 1. Edmund and his four eldest children were working as cotton weavers. Edmund’s wife Mary Elizabeth is mistakenly given as Mary A. This is corrected in the 1911 census. Ten years later they were still in Earby, but at 10 Stoney Bank Road. The three older sons served in the First World War. Edmund joined the West Riding Regiment. Willie joined the King’s Own (Royal Lancaster) Regiment. Robert served in the Royal Navy as a sick-berth attendant. who died on Wednesday, 21st February 1917. Age 38. Additional information: Son of Mr. and Mrs. E. Priestley, of 10, Stoney Bank Rd., Earby; husband of Mary A. Priestley, of 7, Cardwell St., Padiham, Lancs. Commemorative Information Memorial: THIEPVAL MEMORIAL, Somme, France. 23717 Pte Edmund James Priestley, 2/DoW’s W.Riding Regt. Edmund senior died a month later, on 23 March 1917, aged 61. The cause of death was “1. Chronic Nephritis, 2 years. 2. Cardiac Failure.” Nephritis is a disease of the kidneys. One cannot help wondering whether the heart attack was in part brought on by the death of his eldest son. When he died he was back living at 10 Spring Terrace, Earby. The death was registered by his twin brother Edwin Priestley, who was present at the death. Edwin’s address was 256a Todmorden Road, Bacup. At the time of his death Edmund was still working as cotton weaver. The sons of Edmund James were John Edmund and Jim. Willie was also married, to Agnes. Jack says, ‘Brother Willie was gassed during the War, survived as an invalid but had no children. I now realise that Aunt Agnes, whom I was taken to see when in Burnley, was his widow. The youngest son John became a mill manager and had two daughters and a son. That son, Ronald Priestley, was the first member of the family to go to grammar school and university. He became a lecturer in chemical engineering in the University of Birmingham. One of the daughters, Netta, as Mrs Somersgill, lived in the parental home, 12 Millbrow Road, Earby, Barnoldswick, Lancs.